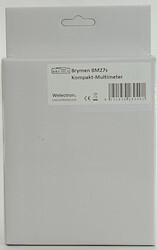 Brymen is one of the good DMM manufactures and have a large selection of DMM's in their program. 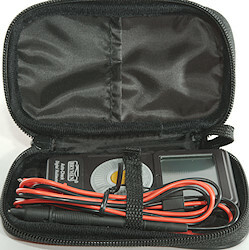 This meter is a smart pocket meter. The meter arrived in a plain white box with a sticker (This is probably related to the dealer I bought it from). 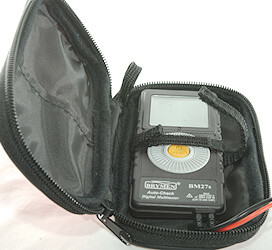 It contained the meter, a manual and a pouch for the meter. 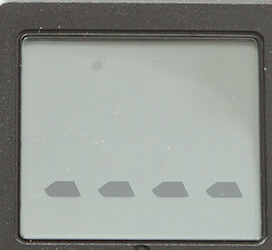 The probes are small without any text, but they do have tip covers. The range switch can be turned with one hand without the meter moving around. 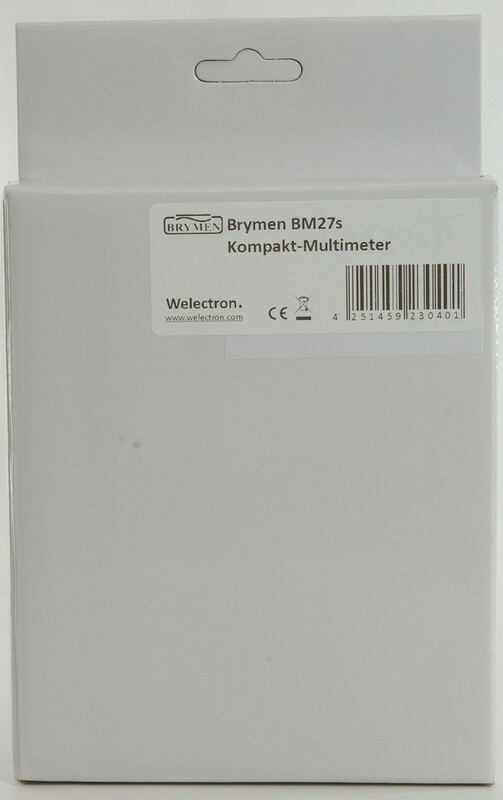 There is a list of the ranges on the back of the meter. 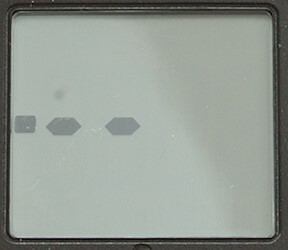 The above picture shows all the segments on the display. 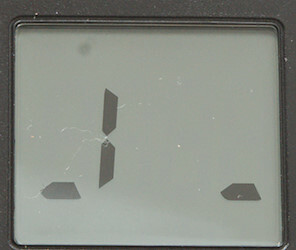 It is missing the A symbol, this means the current range is lacking a A on the display. 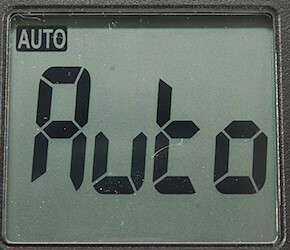 Meter is in auto mode and waiting for voltage or resistance. 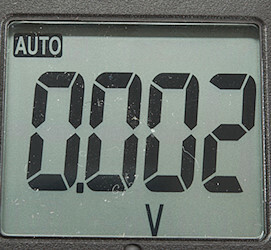 Voltage in AUTO mode, here I manually selected it (I do also need a new battery). Continuity mode with open and closed connection. 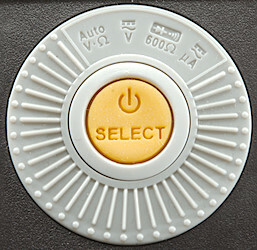 Select: Hold down to power on/off, press to select range (Se list below). Frequency input triggers around 1V. At 1Vrms input frequency range is from 2Hz to 14kHz in AUTO with Hz selected. At 3Vrms input frequency range is from 2Hz to 70kHz in AUTO with Hz selected. At 3Vrms input frequency range is from 1Hz to 70kHz in V with Hz selected. 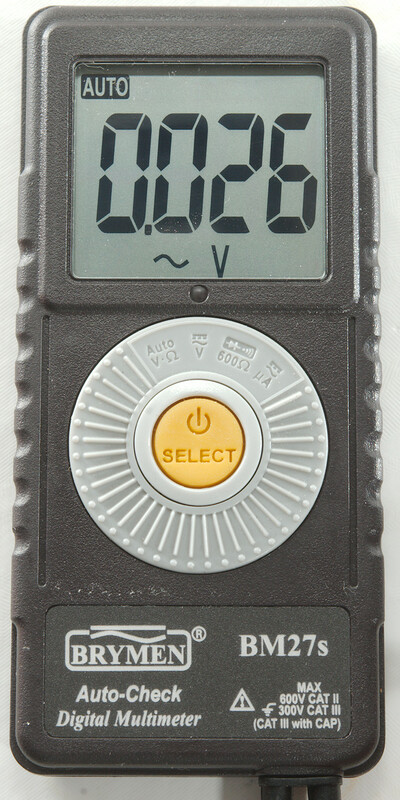 Auto input requires 1VDC to select VDC mode. Auto input requires 1.7VAC to select VAC mode. 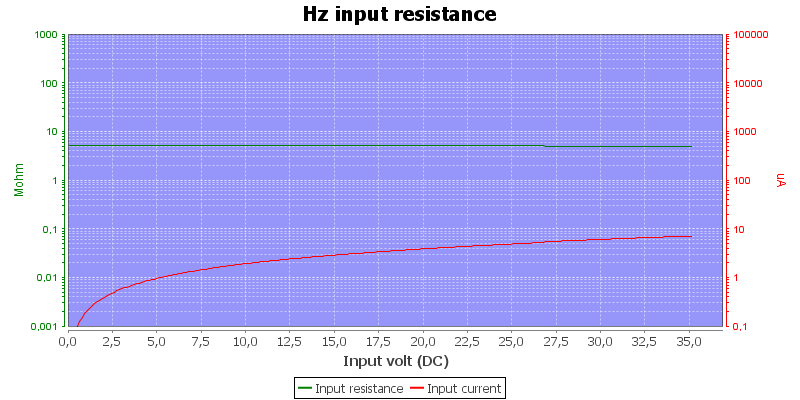 Input impedance is about 5Mohm on voltage input, this includes frequency selection. 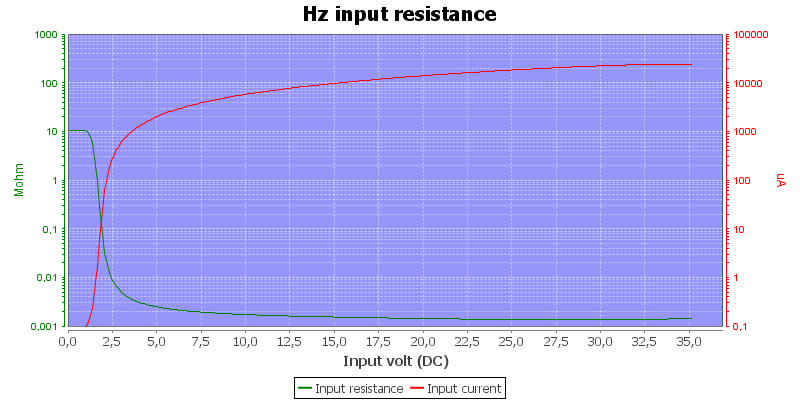 Auto input impedance (LowZ) varies from a few Mohm at low voltages and down to 830kOhm at higher voltages. Frequency input on AUTO has 10Mohm below 1.5V and drops to a 1.5kohm above. Input rated to 600V AC/DC overload protection. Ohm needs about 2.5s to measure 100ohm in AUTO mode. Continuity is quick (About 60ms) in AUTO with selected continuity. Continuity is fast (About 30ms) in Continuity/Low ohm mode. Current consumption of meter is 0.9mA in most ranges, but AUTO VAC and VDC is 7.5mA due to the current to switch the LowZ resistor on. 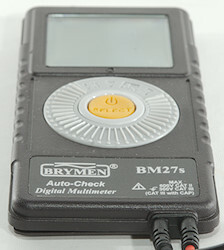 Meter works down to 2.3V where meter turns off, battery symbol show at 2.5V. Reading is stable until meter turns off. Will automatic turn power off in about 200 seconds when not used. 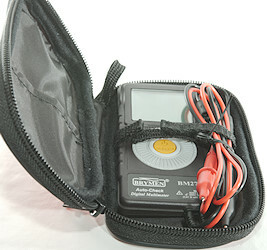 Weight is 78g without accessories, but with batteries (Pouch is 35g extra). Probe wire is soft, thin and 65cm long. 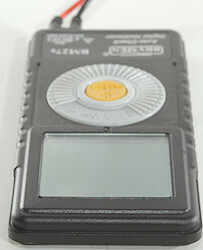 In auto mode the meter has a slight voltage on the probes and will pulse them sometimes. Frequency input resistance in AUTO mode, it is the logical frequency input. 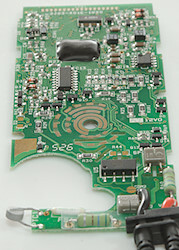 Frequency input resistance in V mode, it is the high voltage frequency input. 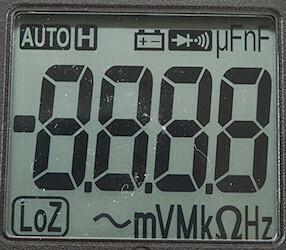 Low current range has a 0.9uA offset. Mix of AC and DC voltage will confuse both AUTO and volt mode. I had to remove 1 screws to open it. 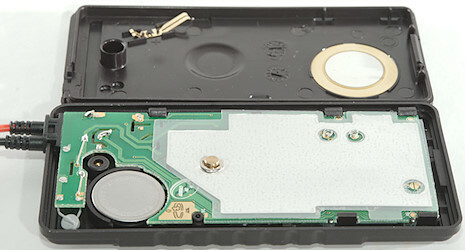 The back contains the buzzer and a bridge to connect battery to circuit board. 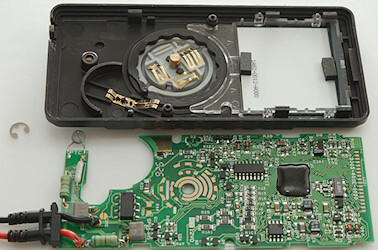 The meter is shielded with holes for springs that connect to the buzzer and a switch pad (It is marked SELECT2 as can be seen below). I had to remove one locking ring and unclip the circuit board to take it out. 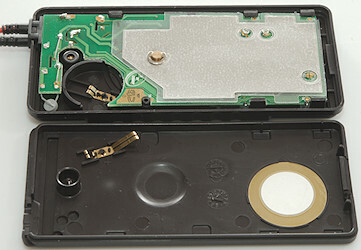 The front has the LCD display, the range switch and part of the battery holder. 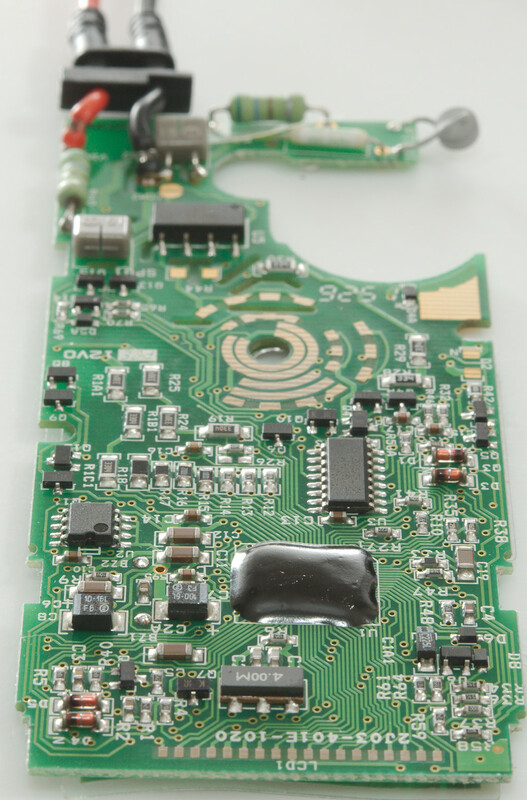 The shield is glued to the circuit board in one corner. There are a lot of test points on this circuit board and not much else. All the cut-outs are for better high voltage isolation. There is a good input protection with series resistors (R56 & R60: 2x 560ohm), PTC, fuse (FS1) and two spark gaps (SPG1 & SPG2). There are also some transistor pairs (Q3 & Q5, Q4 & Q4A, Q8 & Q9) for protection. The relay (U5: Cosmo KAQW414S) is probably the reason for the high current consumption in the Low-Z ranges (It requires some mA to turn it on). The Low-Z may be 3 resistors (R28. R29, R30: 3x330k). There is two input chains (R1A1, R1B1, R1C1: 3x3.3MOhm and R19, R24, R25: 3x3.3Mohm) and they must both be used simultaneously to get the 5Mohm input impedance of the meter. The current shunt is a resistor (R42: 100ohm) with a transistor clamp (Q3 & Q5). The reason for the high burden voltage is not this resistor, but because it uses the normal input protection (R56+FS1+PTC). 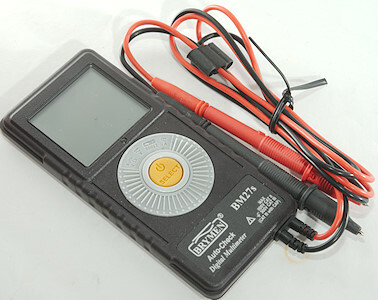 The meter has revers polarity protection from the battery by a low forward voltage diode (D4A). With all the automatic selection going on it is no surprise that there is a mux (U3: 74HC4053). The main multimeter chip (U1) is hidden and probably read its calibration from U2 (Probably a EEPROM). The CAT rating is probably correct, the protection looks good and Brymen marks correctly. Ohm both exist in normal ohm and low ohm. 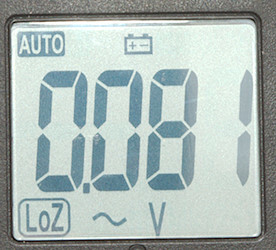 Voltage exist in Low-Z and normal voltage. 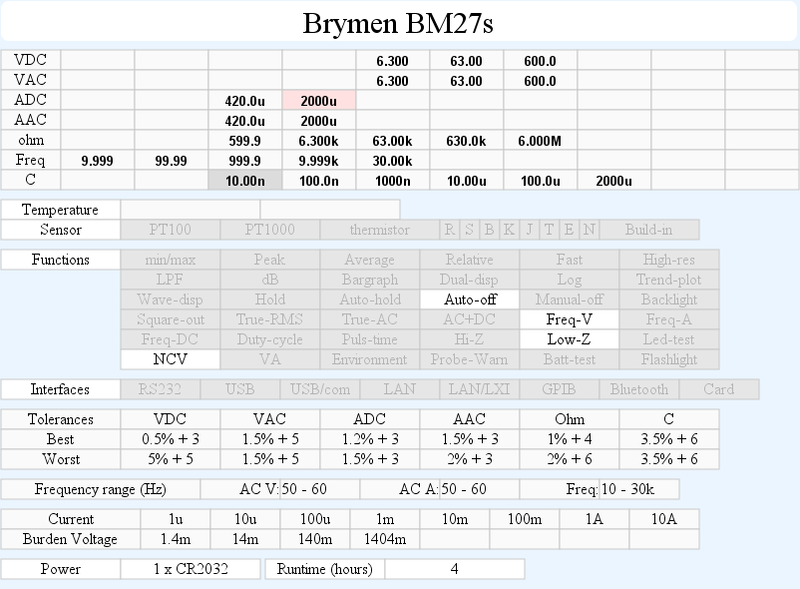 Frequency exist in both AUTO and V switch position. Continuity can be done in ohm, continuity, low ohm and diode mode. The usefulness of the high current range is fairly limited due to the very high burden voltage. The low capacitance range has very bad precision and is not rated. The auto function is nice, but with all the above user interface issues it is not that easy to use all the functions. This meter is probably sold in more or less rebranded versions.